From the outside this one looks good enough to eat. Open the box and the array is dazzlingly confusing as design triumphs, spread after spread, over clarity and the exposition of what turns out to be a most informative text. 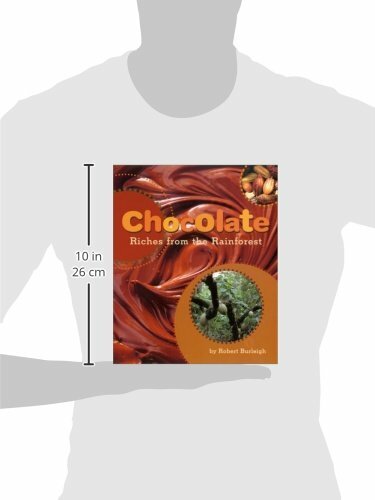 This is a totally American book (chocolate is our 'favorite flavor') which is not inappropriate, considering chocolate's Mexican origins from which this remarkable comestible's history is traced up till today. We learn about cacao's growth and harvest, its development first as a drink and then (not until 1828) as a suckable solid, the memorable contribution of Milton Hershey and that the many Tootsie Roll factories around the world daily produce 49 million wrapped candies. Burleigh touches but lightly on chocolate's miserable association with the slave trade both past and present, and misses the opportunity to mention that cocoa products are one of the foodstuffs of which fairly-traded brands are widely available (but then in America perhaps they aren't?). So if you can stomach the utterly over-the-top (well chocolate-box, really) production, there's quite an interesting read here, not least about the American attitude to this potent brown stuff that Aztec sacrificial victims drank mixed with blood.